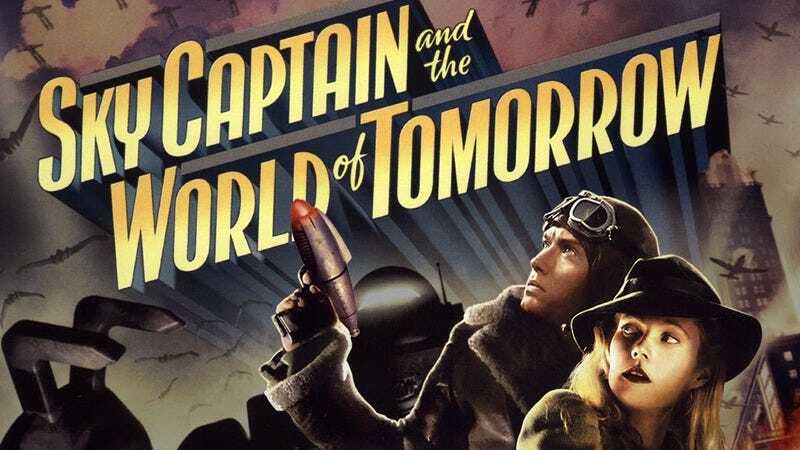 Read This: What happened to the creators of Sky Captain And The World Of Tomorrow? Over at The Telegraph, Olly Richards penned a really fascinating profile on the famous flop Sky Captain And The World Of Tomorrow, the retro-futuristic adventure film from 2004. While the piece gets down to the nitty-gritty of what went wrong (and right) with the making of the film, it’s even more so a psychological profile of brothers Kerry and Kevin Conran, the creative forces behind the project. Coming from a background of design and illustration, the pair came up with idea to film an entire movie on blue screen and add in the sets and effects later—a commonplace filmmaking technique now, but a revolutionary one at the time. The piece profiles the ways in which the Conrans were somewhat overwhelmed by how big the project became. After spending years working on a proof-of-concept short, they managed to win over big-name Hollywood producer Jon Avnet who in turn helped land major stars like Jude Law, Gwyneth Paltrow, and Angelina Jolie. The Conrans had hoped to use their blue screen technology to make films cheaply, but their requested $3 million budget somehow exploded into a $70 million one—a figure that made the film’s worldwide $58 million box office take a disaster. For his part, however, Kevin doesn’t support those official numbers, arguing the film was actually created for more like $20 million. Despite some critical success, the film’s box office failure was a curse. Neither Kevin nor Kerry have directed a feature film since. But the Telegraph piece suggests that might partially come down to the fact that the Conrans were never really comfortable in the world of Hollywood. Unlike gregarious directors like George Lucas and J.J. Abrams, the brothers are introverted and self-deprecating and the profile finds a lot of empathy for Kevin’s insecurities and small-scale goals (Kerry declined to be interviewed). Mine and Kerry’s motivation for this was to make the movie. We weren’t thinking about getting rich or any of that stuff… The thing is, I realise now that people were looking at us like some kind of giant summer movie tentpole, like Spider-Man. We were never making Spider-Man. We weren’t trying to compete with those movies. We were quirky and little. The profile is well worth a read, not just for Sky Captain fans, but also for anyone looking for an inside look at the human side of Hollywood filmmaking.